Suddenly, the network is cool again. Tech trends such as the Internet of Things, software-defined networking and growing end-user expectations all add up to a demand for “dialtone” network performance and reliability. But as the data deluge continues to accelerate, and as organizations continue to rely on multiple clouds to achieve business goals, how can the network keep up, much less meet tomorrow’s demands? 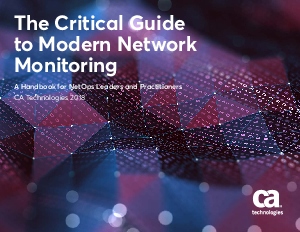 This e-book looks at the trends that are impacting the enterprise network—the modern network—the issues it creates for NetOps professionals, and how organizations can act today to plan for tomorrow.